, a Greek poet of great celebrity, was born at Teos, a sea-port of Ionia. Madam Dacier endeavours to prove from Plato, that he was a kinsman of Solon’s, and consequently allied to the Codridae, the noblest family in Athens; but this is not sufficiently supported. The time when he flourished is uncertain; Eusebius placing it in the 62d, Suidas in the 52d, and Mr. le Fevre in the 72d olympiad. He is said to have been about eighteen years of age, when Harpagus, the general of Cyrus, came with an army against the confederate cities of the lonians and Æolians. The Milesians immediately submitted themselves; but the Phocseans, when they found themselves unable to withstand the enemy, chose rather to abandon their country than their liberty; and getting a fleet together, transported themselves and families to the coast of France, where, being hospitably received by Nannus the king of the country, they built Marseilles. The Teians soon followed their example; for, Harpagus having made himself master of their walls, they unanimously went on board their ships, and, sailing to Thrace, fixed themselves in the city Abdera. They had not been there long, when the Thracians, jealous of their new neighbours, endeavoured to give them disturbance; and in these conflicts it seems to be, that Anacreon lost those friends whom he celebrates in his epigrams. This poet had much wit, but was certainly too fond of pleasures, for love and wine had the disposal of all his hours. 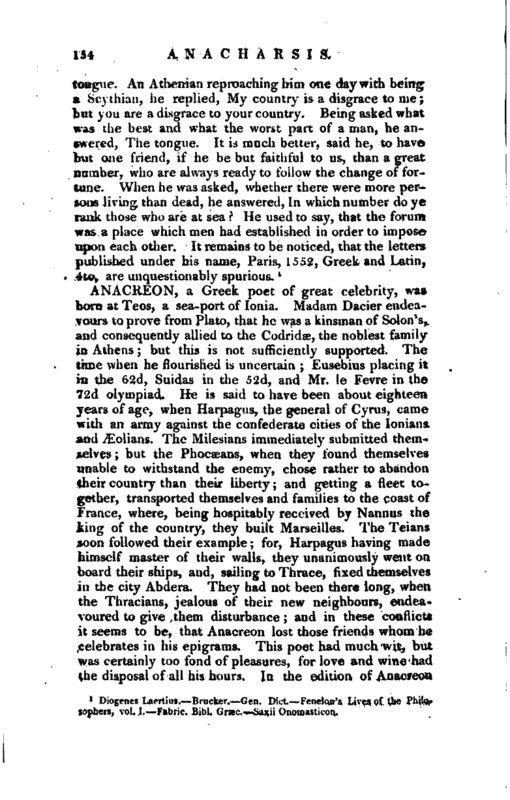 In the edition of Anacreon | and Sappho published in 1789 by Fred. G. Born, of Leipsiclc, this editor endeavours to defend Anacreou against the charges of inebriety and unnatural lust, and with considerable success. These imputations, however, have been cast on his memory by the majority of writers, except, perhaps, Ælian. 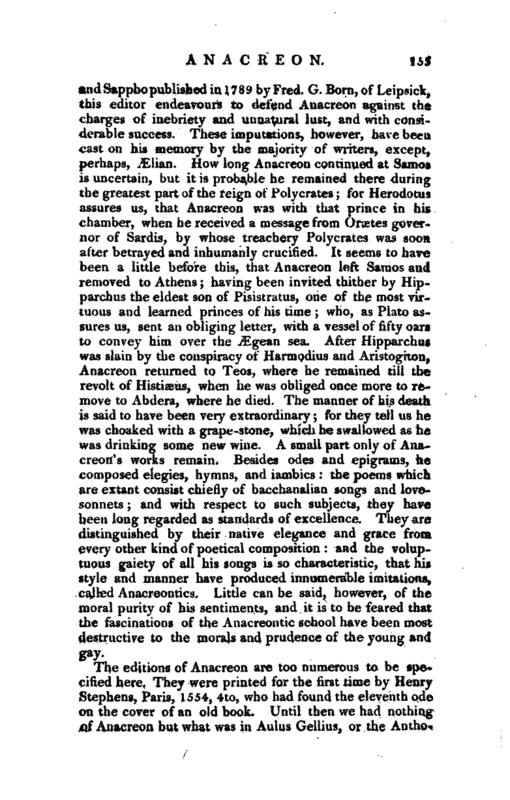 How long Anacreon continued at Samos is uncertain, but it is probable he remained there during the greatest part of the reign of Polycrates; for Herodotus assures us, that Anacreon was with that prince in his chamber, when he received a message from Oraetes governor of Sardis, by whose treachery Polycrates was soon after betrayed and inhumanly crucified. It seems to have been a little before this, that Anacreon left Samos and removed to Athens; having been invited thither by Hipparchus the eldest son of Pisistratus, one of the uiost virtuous and learned princes of his time; who, as Plato assures us, sent an obliging letter, with a vessel of fifty oars to convey him over the Ægean sea. After Hipparchus was slain by the conspiracy of Harmodius and Aristogiton, Anacreon returned to Teos, where he remained till the revolt of Hisfciseus, when he was obliged once more to remove to Abdera, where he died. The manner of his death is said to have been very extraordinary; for they tell us he was choaked with a grape-stone, which he swallowed as he was drinking some new wine. A small part only of Anacreon’s works remain. Besides odes and epigrams, he composed elegies, hymns, and iambics: the poems which are extant consist chiefly of bacchanalian songs and lovesonnets; and with respect to such subjects, they have been long regarded as standards of excellence. They are distinguished by their native elegance and grace from every other kind of poetical composition: and the voluptuous gaiety of all his songs is so characteristic, that his style and manner have produced innumerable imitations, called Anacreontics, Little can be said, however, of the moral purity of his sentiments, and it is to be feared that the fascinations of the Anacreontic school have been most destructive to the morals and prudence of the young and gay. 1 Gen. Dict. 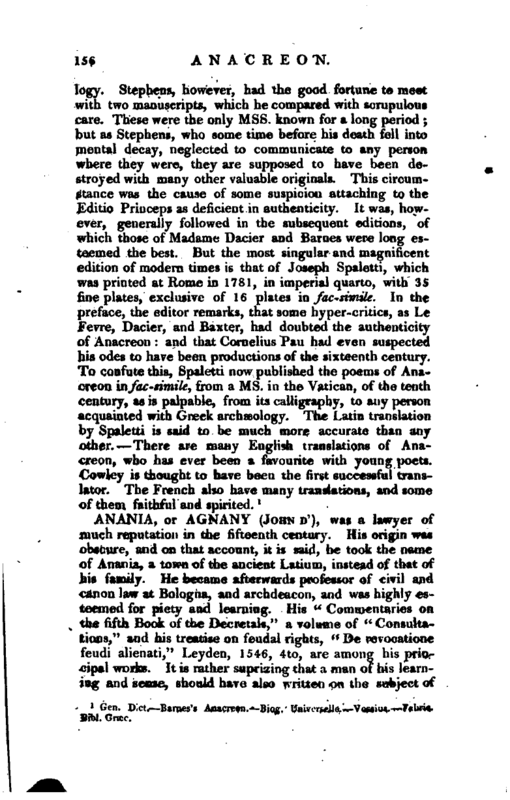 Barnes’s Anacreon. Biog. Universelle. —Vossiuss Fabric, Bibl.